If you haven’t voted yet… GO VOTE! I have a handy voter guide here and you can find your voter location here. But that’s not what this post is about. It’s about trying to understand what’s happening with voter trends and why. It’s notoriously hard to predict city elections. They take place in March and usually have dismal turnout. In 2014 we had 15% turnout and in 2015 it was 12.6%. The 2016 city election coincided with the presidential primary so its data is skewed. To start with we have a lot more voters in 2017. In 2014 there were ~72,000 voters and in 2015 there were ~73,000. Right now there’s 88,194 people qualified to vote in this city election. That breaks down to ~123% increase or a full 16,400 more voters. This is mostly due to the 2016 election voter registration drive, but nevertheless, if turnout and vote share stay the same as 2014 then we can expect some 6,800 votes on election day. The Early Vote (EV) count lines up nicely but there’s far fewer Vote By Mail (VBM) ballots than expected. And to compound this oddity the trend has been for a higher vote share from VBM and a lower vote share from EV. What gives? The key is to see who is voting. 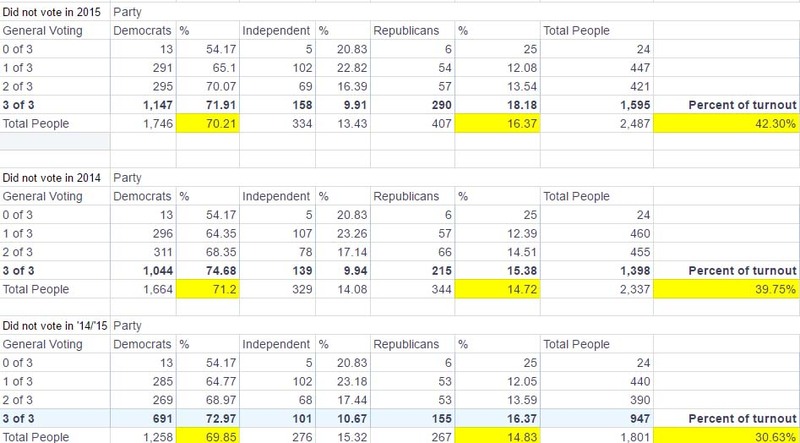 In 2014 Republicans made up 28% of the voters at the polls, 22% EV, and 26% VBM. The Democrats, unions, and other left leaning groups have made major pushes to close the VBM partisan gap which was achieved in 2016. Over 90% of Democrats and over 95% of Republicans who cast their ballots by mail in 2017 also did so in November of 2016. This could account for some of what we’re seeing this year but not all of it. The Republican vote share for EV is down to 15% and VBM is at 20%. Are the Republicans waiting for election day to vote? There were only some 60 more Republican VBM and some 30 more Republican EV votes cast in 2014. The demographic trends are favoring Democrats but not by these margins. But I don’t think these reasons tell the whole story. Of the people who have voted so far 42% didn’t vote in 2015, 40% didn’t vote in 2014, and 31% didn’t vote in 2014 or 2015. Most of these are regular November voters who don’t vote in city elections. And these voters are overwhelmingly Democrats. So what does this mean? It could mean that Clawson, Carter, and Warren are in big trouble. Carter is dropping A LOT of money in his race at the last minute. With the Chamber’s PAC mailers he’s spending well over $60,000 and some of that was for polling. Maybe they’re reading the same tea leaves. It’s also very telling that the chamber has all but dropped Clawson from their outreach effort. I did see the chamber putting out Facebook adverts for Warren in At-Large but no mail. And even those Facebook ads were short lived. Maybe they’re understanding the risk that their strong support could actually drive this electorate away from Warren. But most excitingly this could also mean that the electoral push back to the Trump agenda is starting early. Could this be a sign of the so called “Indivisible Wave” expected in 2018? Either way it’s terrible time to be a Republican in the Democratic stronghold of Gainesville. Note: The numbers used here vary because of when they were pulled and how they were compiled but the general trends stand.